>Today’s New Band – Zombie Zombie – Bestival Themed Week! >Having returned from Bestival yesterday, the most surprising aspect in retrospect was that the weekend of mud, more mud and a dislikeable mixture of mud and (hopefully cattle) faeces, did not actually dampen (GEDDIT? LOLZ!1!11!!) the intrepid A.N.B.A.D team/posse/masochists one bit. In fact, it was almost a triumph, and the Saturday night, after the powers that be had finally decided that we were requisitely muddy, was one of the best ever experienced at a festival. Lethal Bizzle – couldn’t have got the crowd more excitable or more kinetic unless they’d lobbed AIDS-riddled rats with live hand grenades strapped to their backs into the audience. Brilliant. Wandering backstage by mistake and finding a row of pristine, spotless (i.e. poo-less) toilets – pure pleasure. Obviously, being A New Band A Day, we weren’t only there to see these established bands, but to also check out some of the new ‘uns. So for the rest of the week, we’re keeping on our inevitable 3-am purchases of Peruvian pixie hats, glo-sticks and day-glo face paints and we’ll be showcasing bands from Bestival. A Themed Week! Hooray! Today’s New Band managed to brave the Introducing stage, shortly before it finally plunged head first, Titanic-style, into the mud. 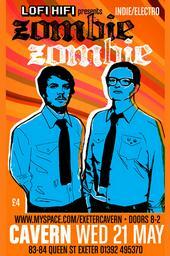 They are Zombie Zombie, and, like their name, are delightfully confusing and confusingly delighting in equal measure. Live, their swirling, wilfully bizarre sound fills the air with the same all-consuming unease in the same way a crowd of the undead pressing their faces against a window might. On record, they sound less ear-worrying, but grind out great tunes – Walk of the Dead is a the bleepy, creepy, sound-of-adrenaline music that would be played in a futuro-dystopian zombie movie during the bit where the hero steels themselves to face the flesh-hungry hoards. With that in mind, Driving This Road Until Death Sets You Free soundtracks the scene where the same, now-bloodied, hero only just manages to flee, terrified and weeping. It’s pin-sharp, taut and would give you the creeps if you listened to it in a dark room. Yummy. Sometimes a good scare is what you need. Posted on September 9, 2008 by Joe Sparrow. This entry was posted in Today's New Band and tagged Bestival Theme Week, French, synth-o-tronic. Bookmark the permalink.